Tim was terrific! He was able to give us a great orientation to Stockholm. Tim's knowledge of history, politics, culture, and world affairs added to the richness of our tour. Tim was an outstanding guide. He met us at the ship as agreed and we had a very informative three days. We spent the first day and one half in Stockholm and covered all major attractions. Tim was very knowledgeable and patient. We never felt rushed and even though Tim had a schedule he was very flexible. The second day was a drive outside of Stockholm to Spigtuna which was very enjoyable. Tim was very good and did a great job getting us around the city. Loved our tour with Tim. Spent the day on a wonderful, solar powered boat learning about Stockholm....the perfect way to see/understand the city, esp on a hot summer day. Tim was incredibly knowledgeable and funny. Don't hesitate to book this tour! Tim was absolutely wonderful. We had an amazing time in Stockholm and saw more then we expected during a very short visit. Tim is a very knowledgeable guide and I was amazed at how much I had learned. If you are in Stockholm, Tim is the guide for you. We were very lucky that he was available. I am very thankful to Tim for such a great tour. Stockholm will be quite memorable in our hearts. Thank you, Tim! We were four people, first visit, Tim was a wonderful tour guide. He was very knowledgeable of history and answered all our questions. We wanted to have lunch a local restaurant and his recommendation was exactly what we enjoyed. Thank you for a wonderful visit . Tim showed us all the parts of Sweden that we were hoping to see. He had a very thorough knowledge of the city and the history. He accommodated our dietary needs but it would have been nice if he had a few names of places to suggest. Tim, is an excellent guide! He's extremely knowledgeable and has a great sense of humor. He's also very flexible (if you want to deviate from original tour plan, no problem.) Our transportation was comfortable and we had a good driver. We made a great choice when we chose Tim. Tim is a great an knowledgable guide. This was a coustom boat tour which he easly arranged. This was my second time with Tim and would recommend and go again. TOUR GUIDE RESPONSE: Thanks Bruce, nice to see you again, hope all your excursions, went well, hope to see you soon again. Tim was a wealth of information and really knew his way around Stockholm. He was very flexible in arranging for us to see the sights that interested us the most. His commentary made the visits even better. We wouldn't hesitate to use him again. We had a great day with Tim. He took us all over the city. There wasn't a question about Sweden - or anything about European history or current events - he couldn't answer. Lovely day with a highly qualified guide. Tim did a great job as our guide. He turned a raining morning into a fun filled day! He was promptly waiting for us that morning with fresh cinnamon buns to start our day. His knowledge of the history and getting us around the city in traffic was wonderful. I would highly recommend Tim for your next tour. Tim provided a great tour! Tim was an excellent guide...humorous, engaging, extremely knowledgeable, and fun. We were a group ranging in ages of 16 - 78 and Tim was able to relate to and keep the younger individuals in our group interested in the sightseeing. As far as guides go, Tim was the highlight of our trip. Thanks, Tim, for an unforgettable tour of Stockholm! Tim was fantastic. He was a good communicator prior to the trip and prompt to arrive the day of the tour. We had a group of six and his style worked well. He had the right balance of knowledge and humor and he adapted quickly to our group. One of my favorite parts of the tour was the vasa museum and going on his electric boat in the canals. He felt like more of a host sharing his culture than a tour guide. He even taught me a little about my Swedish roots. Thank you again Tim from me and my family! Very good tour of Stockholm with Tim. An excellent guide, who made sure we had plenty of time to see all the highlights. Tim was very knowledgeable and personable. He took us to places that most tourists do not see which made for a very interesting visit to Stockholm. I highly recommend him to anyone visiting Stockholm. Tim's tour was very informative and his sense of humor made the day with him most enjoyable. His tour was specifically catered to our wishes and his suggestions left us with a feeling we saw the Stockholm that we will remember pleasantly for a long time. Tim was an outstanding guide. He was waiting for us at the airport when our flight arrived ahead of schedule. He took us to Uppsala, Sigtuna and Drottingholm and he even then drove us around Stockholm for an overview. Tim was very knowledgeable and personable and we thoroughly enjoyed our conversations with him. We would highly recommend him..
Tim is amazing! My group and I loved the tour we took in in Stockholm with Tim. I only wish we had more time! Tim is very flexible and accommodating with what you want and places where you want to go. I definitely recommend taking a tour with Tim. Tim is an outstanding guide. We spent 2 full days with him - one in Stockholm and one in Sigtuna. The VASA was a highlight and we spent a few hours there. We walked down some of the streets to enjoy the shops, and toured the city by car. The trip to Sigtuna was awesome- loved the local lunch, ruins, shopping in the local supermarket, and the SNOW! Tim went out of his way to accommodate our handicaps, and to get things my son wanted. You will have the trip of a lifetime with Tim. Tim was flexible, knowledgeable and personable. A great combination in a tour guide. He met us at the airport and we let him decide where we were going to go. He did a terrific job and we didn't have to worry about anything. I can honestly say we saw sights we wouldn't have chosen on our own accord, and we would have been far worse off on our own. He also helped us with our particular dietary needs and made extra stops when needed. Finally, this wasn't a go through the motions tour. He was very thorough. TOUR GUIDE RESPONSE: Hi Jai, Thanks. I am glad you enjoyed the tour/Best regards to all of your great family and hope you have a good time in Norway! Great tour informative and a very witty man. Nothing was a problem. .
Tim was an outstanding guide. Very knowledgeable and fun! We would highly recommend him. Tim took us on a journey of all the highlights of Stockholm in one day. We appreciated his humorous style, and we got a very good impression of the city. He also gave us a lot of useful tips, such as which tourist traps to avoid. We can definitely recommend him for a city trip in Stockholm. What a fabulous tour! Tim is very knowledgable and likable guide. He truly made our time in Stockholm the best. We would recommend him over other tour guides we have had in other cities. We spent an entire day touring and ending up in a tour in his boat. What could be better!!! Tim was the most entertaining, engaging and informative guide we've ever had. If you want to see and learn about Stockholm, there is only one choice - Tim. Tim did a great tour for us. We went multiple places & he was able to drive his van right up to the front door of almost every spot that we went to-- it was amazing! He was funny, very knowledgeable about the architecture & the history, it was a wonderful tour. He took care of all of our needs. I would recommend him without hesitation to anyone wants a tour in the area! We had a great tour with Tim. He picked us up at the port as arranged and spent the day running us where ever we wanted to go. Would use him again. Truly a beautiful way to see Stockholm in a very relaxing manner. We so enjoyed the boat ride through Stockholm, and to a small island, through a lock. Tim was very knowledgeable and a great companion on our ride. Thank you for a wonderful day! Our tour today was outstanding! Tom was extremely informative, his English was excellent, and he was very professional and friendly. If we are ever back in Stockholm again--we would not hesitate to ask for Tim to guide us again!!! We decided to book the boat tour with Tim after reading the other glowing reviews. None of the reviews were over exaggerations. Tim truly customized our trip to our interests. His historical knowledge of Stockholm was amazing as well. He even added a car portion of our tour and took us to specific addresses that had personal historical significance. Don't miss booking a tour with Tim. Tim in Stockholm was great--We all enjoyed his tour very much! The only nagging thing was we paid more for this tour than all of the rest and a perceived negative was we had to pay for museum entrance fees, lunch( bought his)...It might have been indicated on the website and we missed it. In our opinion after spending so much, just bump the price and be done with it. Terrific time with Tim. He is very knowledgeable and has great stories to share about the history Stockholm. He was a wonderful guide! Tim is a terrific guide! All four of us enjoyed our all-day tour of Stockholm immensely. He picked us and our luggage up at the ship and deposited us later at the hotel. He knew all the right places to go, how to get to them both efficiently and by giving us a scenic tour along the way, with a constant stream of commentary. And he gave us touring options, though we generally defaulted to his excellent choices. We give Tim our highest recommendation! The Stockholm by water tour was great! Tim was a terrific guide and he and Jenny made things convenient, fun, and informative. My family of five had a wonderful time, and this tour was one of the highlights of our trip in Scandinavia. And we greatly appreciated how Tim coordinated with Jenny and helped to arrange a land tour with her for the next day. Tim was very knowledgeable and friendly and very funny! He showed us all the highlights of Stockholm. Would highly recommend him to anyone. Tim was very accommodating with the tour. We asked for something different than his standard tour because we had already seen one of the items on his tour and he quickly moved into a "Plan B". Tim has a great personality, injects humor into the topic and works hard to find items of specific interest to his clients. It was a very enjoyable tour and I would recommend it as a "must do" in Stockholm. Tim did a awesome job of showing us all of Stockholm in a day. We hit all the cool view spots around town. One of our favorites was the Vasa Museum. The Vasa sank in 1638 and was recovered in the harbor in 1961. We also saw the Skansen, the Royal Palace, the Cathedral and Riddarholmen Church. Lots of history to learn about. Tim was a great tour guide!! A wonderful one day trip in Stockholm. Tim is a nice and humorous tour guide. He also arranged a comfortable bus for our 18 people group and picked us up right at the pier, it saved a lot of time on traveling to the city. Very friendly and knowledgeable guy. Accommodated our schedule and desires perfectly. Only reason he didn't get five stars was that his vehicle is a bit on the beater side. Definitely needs a detailing and some new floor mats and the like. Tim is amazing, as is his counterpart, Jenny. They were accommodating and excellent at explaining everything. However, the best part was how warm and caring they were. They both clearly wanted to show us how great their city is, and they achieved this! I highly recommend both of them and the water tour is great if you enjoy boats. Money well spent, without a doubt! tim , you truly have a great sense of humor! thank you for sharing stockholm with our family. Tim is a WONDERFUL guide. He is super knowledgeable, funny and an all-around interesting person. He scored big points with our 5 kids by bringing along candy and drinks. We loved his personal touch. We were able to see so much of Stockholm without fighting the cruise ship crowds. Don't hestitate, book this tour! Tim gave us a great tour did all that he could to accommodate us. We recommend him without reservation. Tim is a happy guide, always smiling and inviting the group to enjoy the tour. Excelent !!! 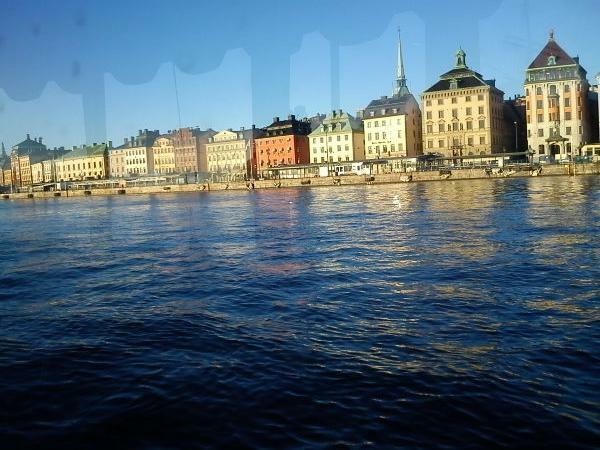 Tim R. provided us with a spectacular water cruise through Stockholm. He also walked with us through some highlights on Glama Stan. He is very knowledgeable about Sweden's history as well as current events affecting the country. He adapted well to our pace and timing and we thoroughly enjoyed his company. He even circled around to get better pictures whenever we requested! cant't begin to express how great Tim was....we had two exits from the ship...he had placed a colleague at one exit and he at the other to make sure he didn't miss us....he was a very knowledgeable guide...English impeccable...very easy to talk to...helped my husband achieve all that he wanted to do......he so impressed us that it was our favorite port and one that we would want to come back to and stay for a time...thanks Tim! We booked Tim's tour by water and he personalized a tour to try to give us a good overall feel for Stockholm. The tour was great and Tim's good sense of humor certainly added to our enjoyment. Tim's knowledge of his city also helped us plan our events over the remaining days in Stockholm and the surrounding area. Our time with Tim in Stockholm was the highlight of our Baltic cruise. Highly recommended! Wonderful tour guide and quite knowledgeable. It was a great way to spend the day and learn about Stockholm. Stockholm was a great city to visit, but mostly because of our guide Tim. By the end of our tour, we were ready to take him home with us. For such a short time, he fit in to our 11 member group like one of the family. He was very knowledgeable, flexible and sensitive to meeting our needs and giving us an enjoyable experience. You can't go wrong using Tim to show you Stockholm. Tim was fun, flexible, and a real pleasure to spend our day with. We have just returned home from our trip, and all of us agree that Tim was BY FAR the best tour guide we had during the whole 18 days! perfect day with Tim. Relaxing and gorgeous. Great lunch on a lovely island. Wonderful day touring with Tim. He is a great guide in a stunning city. Highly recommended! He was great with our young family too. Our tour of Stockholm with Tim was fantastic. He was one of our favorite guides on our trip to the Baltic, and really helped us enjoy Stockholm to its fullest. He was very friendly, extremely professional, and especially helpful in making advance preparations to accommodate my elderly father's mobility limitations. He timed the tour perfectly. His guiding us in Stockholm has made us want to come back again -- and very soon! He has our highest recommendation. The boat-tour with Tim was THE ABSOLUTE HIGHLIGHT of our stay in Stockholm! Tim is such a nice person and a great captain - his knowledge of the Stockholm sights and sense of humor made our trip unique! We felt very comfortable on board: the motor is electric and very calm, he had beautiful Music and offered snacks and drinks. Thanks a lot for the beautiful trip and great time!!! If you have two days to spend in Stockholm you MUST start your adventure with Tim. He will give you the water view of the city - which is amazing. We had lunch at one of the islands and ended the day visiting the VASA. Tim can give you lots of history of the country and you will relax on his quiet boat. Absolutely wonderful! Tim is a great guy and very knowledgeable. His boat is perfect and what a great way to see Stockholm. We highly recommend this tour! His English is perfect as well as all Swedes. Touring with Tim exceeded our high expectations. He met us on time, conducted us to his cute boat which is perfect for cruising the inland waters around Stockholm. He was knowledgeable, courteous, friendly and helpful in every respect. We toured the Vasa Museum, old town and enjoyed every stop. On our second day he took us to the little village of Sigtuna - very quaint - and on to the airport. Hire this guide! Really nice and valuable tour!!!!!! We had a tour that combined the land efforts of Jenny with the aquatic efforts of Tim. Tim was an able captain who inspired confidence in his landlubber customers. He pointed out the landmarks and explained their relevance. He was knowledgeable, dryly humorous, and alert to our interests and disinterests. My only criticism is that I wish he had been easier to hear. TOURSBYLOCALS RESPONSE: We have a great team of guides in Stockholm and are pleased that Jenny and Tim were able to work together to give a great tour. Tim was a total delight. Candid, smart, accommodating...and a quiet, clean electric boat - how cool. Tim was prompt and professional. He was knowledgeable and it was enjoyable to spend the day together. Tim catered the locations and tour for our group of six people and provided just the right amount of information. I would definately recommend ToursByLocals.com and Tim. Tim, our tour guide was VERY informative. We had a great day in Stockholm thanks to him, and I am pleased to recommend him to anyone looking for a knowledgeable tour guide for a visit to Stockholm. Most enjoyable and very good with kids. We will use Tim again for guiding services in Stockholm. This was a perfect introduction to Stockholm, and Tim was the perfect guide. His boat is a delight, and we thoroughly enjoyed his running commentary, the refreshments, and most of all, the view from the water. I would recommend Tim and his tour of Stockholm by boat to everyone. Tim did a great job showing us around Stockholm!! Had some great local treats for us too! Loved trying the Reindeer meat and local candies!! Really made our day in Stockholm very special!! We would recommend Tim highly!!! Tim was a wonderful guide for us! He was patient and accommodating, and went above and beyond with providing us with all that we had expressed in our earlier communications! We would highly recommend him to anyone wishing to tour Stockholm.